Magna Carta or "Great Charter," an English charter originally issued in 1215. A charter is a document bestowing certain rights on a town, city, university, land, or institution; sometimes used as a loan of money. The term derives from a root word meaning "paper." As a formal document, a charter is the authorization of certain rights, purposes, and activities, which also include specific responsibilities. Originating in a time when monarchy was the usual form of authority, the term "royal charter" was common, implying that the right to conduct particular affairs or own a piece of land was given by the reigning monarch. In more recent democratic times, charters are more often drawn up and approved by an elected governing body. The principles of the charter's function, however, remain the same—authorization of rights and privileges with concomitant responsibilities to a person or group of people with an approved purpose, one that is considered as contributing to the well-being of others. The word "charter" originally meant simply a paper or written document, and it was often applied to deeds for the transfer of real estate. In contracts of such importance papers or parchment documents were drawn up and carefully preserved as irrefragable evidences of the transaction. Moreover, communities and towns zealously guarded their charters as the "title-deeds of their liberties." After a while the word charter was applied in England to a particular document which specified certain important concessions forcibly squeezed by the people from a most unwilling sovereign. This document was called Magna Carta, or the "Great Charter," signed at Runnymede, June 15, 1215, by John, King of England. In Anglo-Saxon England, charters were used to grant land rights. Charters were issued in medieval times by Royal decree, perhaps giving a particular town the right to hold a weekly market, or to levy a toll on a road or bridge. This pledged to the King. Creating a public or private corporation, such as a city, college, or bank, and defining its privileges and purposes. This may also be referred to as "articles of incorporation." The term "charter" is also used when referring to a contract for the commercial leasing of a mode of transportation, such as an aircraft, vessel, or other vehicle, especially for the exclusive, temporary use of a group of travelers. A charter is a legally binding document incorporating an organization or institution and specifying its purpose, remit or bylaws. Organizations such as the Institution of Civil Engineers in the UK is chartered to maintain and advance the science and practice of civil engineering in the UK, and by this charter has the right to regulate the business of civil engineering in the UK; this gives rise to a status of a chartered engineer—one who satisfies the requirements of the charter holding organization. Royal Charters also exist and may have legal status in the case of universities and similar bodies the power to award degrees normally comes from a Royal Charter. A charter colony is a type of colony that was established by a group of settlers that received a charter. A charter colony was one of the three types of colonies that existed in the British Empire during its height of power. The others were proprietary colonies and royal colonies. Charter colonies were promoted through private enterprise under charters from the crown. Generally, they were established by groups of settlers who were granted charters by the king and had more control over their own affairs than did the other types of colonies, which were ruled more directly by the British. They were founded by trading companies, by lords proprietors and by squatters later incorporated. Colonies of the first type for the most part either disappeared or changed their status early. The Virginia Company lost its charter in 1624, the Plymouth Council for New England surrendered its patent in 1635, the Providence Island colony was conquered by Spain in 1641, and the Massachusetts Bay Company became a theocracy, leaving the Somers Isles Company as the only one of its kind in control of a colony through the greater part of the seventeenth century. Connecticut and Rhode Island, founded as squatter colonies by dissenters from Puritan Massachusetts, received charters of incorporation early in the English Restoration (restoration colony). The predominating type throughout the seventeenth century was the proprietary colony. Of this sort was Carlisle's Caribbean grant, Maryland. Maine, in the early part of the century, and after 1660, the Carolinas, New York, the Jerseys, the Bahamas, and Pennsylvania. Similar institutions of government developed in all of the charter colonies. All ultimately had a governor, council and house of representatives, the former two chosen by company or Lords Proprietor, and in the corporation colonies, indirectly by the people. The house of representatives, first the voluntary concession of the trading company, as in Virginia and Bermuda, later became a generally accepted institution in all chartered colonies except New York. Government in the corporation colonies was the freest from outside control. Perhaps because they were settled without the mediation of trading company or proprietor, the inhabitants of those colonies from the beginning cherished a conception of government based on sovereignty of the people. When the restoration English government turned its attention to the building of a colonial policy, it found charters obstacles in the path. Several colonies were royalized, and, with the view of ultimate consolidation of all colonial possessions into a few large units, the Dominion of New England was established. Its failure brought temporary reaction in favor of charter colonies, but throughout the eighteenth century the process of royalization went on until by 1776, only two proprieties, Maryland and Pennsylvania, and two corporation colonies, Connecticut and Rhode Island, remained. Except in the corporation colonies the people seem to have preferred royal rule. A city charter or town charter (generically, municipal charter) is a legal document establishing a municipality such as a city or town. The concept developed in Europe during the middle ages. Traditionally, the granting of a charter gave a settlement and its inhabitants the right to town privileges under the feudal system. People who lived in chartered towns were burghers, as opposed to serfs who lived in villages. Towns were often "free," in the sense that they were directly protected by the king or emperor, and were not part of a feudal fief. Today the process for granting charters is done by states and is determined by the type of government of the state in question. In monarchies, the charters is still often a royal charter given by the Crown or the state authorities acting on behalf of the Crown. In federations, the granting of charters may be delegated to the lower level of government, such as a state or province. The term charter can refer to the letting, renting or hiring of an object or a service. For instance, a yacht charter concerns the renting of a yacht and it's crew for a set period of time. Chartered buses are used by some groups of individuals who use a common bus in order to go on a trip or go on a tour of a certain location. Charter flights are organized on behalf of a group of individuals who share seats on a plane to travel together to another destination. These flights can be organized by individuals on behalf of other individuals or by tour companies. These companies are commonly referred to as tour operators or inclusive tour (IT) companies. The latter term is used to refer to companies whose charter arrangements include accommodation as well as flights. These arrangements are also known as package holiday or package tours. Firms that charter aircraft without offering any accommodation are "seat-only" operators. In the UK any company or individual organizing charter flights—with or without accommodation—on a commercial basis must obtain Air Travel Organizers' Licensing (ATOL) from the Civil Aviation Authority (CAA) and must lodge a bond with it, which will be used to repatriate charter airline passengers whose tour organizer has failed and who are stranded abroad. The term "charter flights" generally refers to flights and seats on large jets such as those produced by Boeing or Airbus, and is usually a cheap way for individuals to fly on a set route at a set time. In contrast, "air charter" typically involves smaller planes, where one individual or company wants to use the whole plane for a very specific flight at a time of their choosing, and is a much more expensive way to fly. In the United States, charter schools were initiated toward the end of the twentieth century. They are publicly funded elementary or secondary schools which have been freed from some of the rules, regulations, and statutes that apply to other public schools, in exchange for some type of accountability for producing certain results, which are set forth in each school's charter. State-run charter schools (schools not affiliated with local school districts) are often established by non-profit groups, universities, and some government entities. On Usenet, newsgroups in the Big-8, and some other hierarchies must have a newsgroup charter spelling out the purpose of the newsgroup, what constitutes on-topic discussion, and whether or not the newsgroup is moderated. A Royal Charter is a charter granted by the Sovereign on the advice of the Privy Council, to legitimize an incorporated body, such as a city, company, or university. In medieval Europe, cities were the only place where it was legal to conduct commerce, and Royal Charters were the only way to establish a city. The year a city was chartered is considered the year the city was "founded," irrespective of whether there was settlement there before. A Royal Charter can also create or give special status to an incorporated body. It is an exercise of the Royal Prerogative. At one time, a Royal Charter was the only way in which an incorporated body could be formed, but other means such as the registration of a limited company are now available. Among the historic bodies formed by Royal Charter were the British East India Company, the Hudson's Bay Company, the Peninsular and Oriental Steam Navigation Company (P&O), and the American colonies. 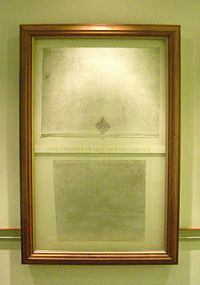 Among the 400 or so organizations with Royal Charters are cities; the BBC; theaters such as the Royal Opera House and the Theatre Royal, Drury Lane; Livery Companies; Britain's older universities; professional institutions and charities such as Toc H.
Photograph of the royal charter of Dartmouth College in Hanover, New Hampshire, signed 1769. A Royal Charter is the manner in which a British town is raised to the rank of British city. Most recently, Inverness, Brighton & Hove, and Wolverhampton were given their charters to celebrate the millennium, and Preston, Stirling, Newport, Lisburn, and Newry to celebrate the Golden Jubilee of Elizabeth II in 2002. Some of the older British universities operate under Royal Charters, which give them the power to grant degrees. The College of William and Mary, in Virginia, was granted a Royal Charter in 1693, and Dartmouth College was granted a Royal Charter in 1769, marking the first and last collegiate grants in the present-day U.S.. The most recent generation of U.K. universities were granted the power to grant degrees by the Further and Higher Education Act, 1992 instead of by Royal Charter, while some other universities operate under Acts of Parliament. Most Royal Charters are now granted to professional institutions and to charities. For example, the six accountancy institutes which make up the Consultative Committee of Accountancy Bodies each have a Royal Charter which allows their members to call themselves Chartered Accountants. A Charter is not necessary for them to operate, but one is often sought as a recognition of "pre-eminence, stability and permanence." In Canada, there are hundreds of organizations under Royal Charters. Such organizations include charities, businesses, colleges, universities, and cities. Today, it is mostly charities and professional institutions who receive Royal Charters. Application for a charter is a petition to the Queen in Council. To receive a Royal Charter, the organization must have corporate members who have at least first degree level in a relevant field, consist of 5,000 members or more, be financially sound, and it must be in the public interest to regulate the institution under a charter. However, meeting these benchmarks does not guarantee the issue of a Royal Charter. 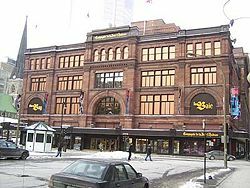 Canada's oldest company, the Hudson's Bay Company, was founded under a Royal Charter issued by King Charles II in 1670. By that charter, to this day the Company is required to give two elk skins and two black beaver pelts to the Sovereign or his or her heirs and successors when they visit the area originally called Rupert's Land. Canada has four Royal Charter cities: Saint John, (the oldest, having received its charter in 1786 from King George III), Vancouver, Winnipeg, and Montreal. A number of Canadian universities and colleges were founded under Royal Charter. A number of Irish institutions still have a "Royal" prefix, even though the country has been a republic since 1949. "We the Peoples of the United Nations… United for a Better World"
The United Nations Charter is the treaty that forms and establishes the international organization called the United Nations. While this document is often misconstrued as a constitution it is, in fact, an agreement between states and not a compact among the individual peoples to create a government. It was signed at the United Nations Conference on International Organization in San Francisco, California, 1945, by 50 of the 51 original member countries (Poland, the other original member, which was not represented at the conference, signed it later). It entered into force on October 24, 1945, after being ratified by the five permanent members of the Security Council—the Republic of China (later replaced by the People's Republic of China), France, the Union of Soviet Socialist Republics (later replaced by the Russian Federation), the United Kingdom, and the United States—and a majority of the other signatories. ↑ National Education Association, Charter Schools. Retrieved October 24, 2007. ↑ Stuart Eskenazi, Learning Curves. Retrieved October 24, 2007. ↑ Privy Council, Royal Charter. Retrieved October 24, 2007. ↑ Department of Canadian Heritage, Test Your Royal Skills. Retrieved October 24, 2007. ↑ Canada's Cities, Unleash our Potential. Retrieved October 24, 2007. Adams, James Truslow. Dictionary of American History. New York: Charles Scribner's Sons, 1940. This page was last modified on 9 May 2013, at 15:13.